Studio and Editor are both authoring components of the iRise platform. Studio is our legacy desktop application. Editor is our web-based authoring space. One or both components can be used to author prototypes on the current version of the iRise platform. With Editor, assembling screens and adding basic interactions is fast, easy, and intuitive, even for new and novice users. But this is just the beginning. We’re continuing to deliver more and more functionality for Editor with each release. However, currently, there are some features in Studio that are not yet supported in Editor. 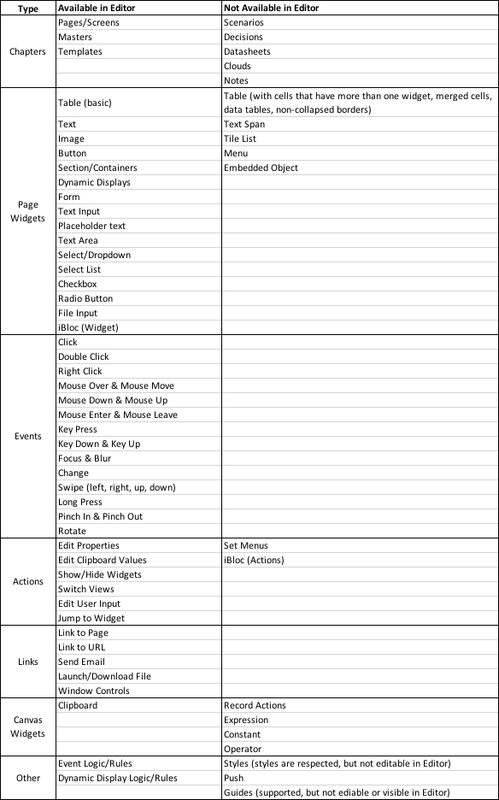 The table below shows what content is supported in the latest version of Editor. Unsupported content on Screens and Masters will be 'read only' in Editor.